Wild Wood Acre Schnoodle Makers - Reference Page 2From the words of the owners who now love the schnoodle babies I once raised. 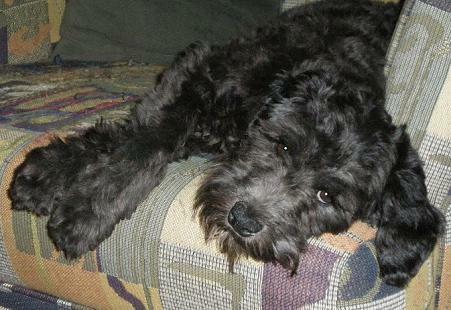 From the words of the owners who now love the schnoodle babies I once raised. "We are a family of 5 - all 3 kids with various allergies including our eldest who has low-degree allergies to dogs (they'ver had no problems at all with Miki). When researching to see what type of dog would be best for allergies, I came across a picture of one of Wild Wood Acre's pups that I immediatly fell in love with! To our great fortune, Wild Wood Acres is located very close to our home and, little did we know when we applied, that the breeder, Christine, would be so incredible. Fortunetly, we were able to visit Christine at her home with the pups and her dogs. We saw first-hand how each and every dog is well cared for which in turn reflects in every pup. As well, Christine was always on hand to answer our many, many questions. If you want an extremly caring, knowledgeable, patient, compassionate breeder who gives all her love and attention to each and every pup to provide you with the most adorable, loveable, sweet and playful, funny and definitely smart. A Wild Wood Acre's pup is the only choice!" Hello Christine, thought you would like to know how Georgia is doing - awesome!!! She has the most amazing eyelashes that she gets from her Mom Holly. She is such a character - she loves to bark (which we are nipping in the bud), loves to play with her toys, especially chasing ice cubes around the house! She did very well in puppy class and even won a few competitions the close leash walking and come. She is a very smart girl and picks up things very quick. Her coat is soooooo soft and thick and she is starting to show her silver. She doesn't mind her grooming and loves her baths. Thank you again for giving her such a great start in life - we love her to bits and tell everyone where we got her. 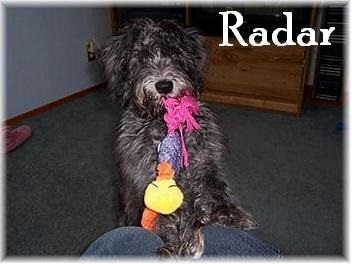 "Radar came to us on Nov.'04 and he is the sweetest, most lovable and intelligent dog I have ever owned. After our first meeting I could tell that Christine's dogs were very much part of her family. She is a loving breeder who wants the very best for her dogs and it shows in her puppies. She is also there to help or answer questions that may arise. 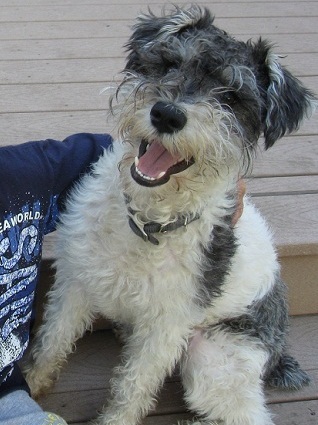 There is not a day that goes by that we regret getting Radar and I would highly recommend a Wild Wood Acre puppy to anyone who is considering the schnoodle breed. They are a top quality dog with amazing temperaments and wonderful personalities". Pat and Richard from Manitoba Canada. Max at 11 months old. A Diva and RipperRoo baby. 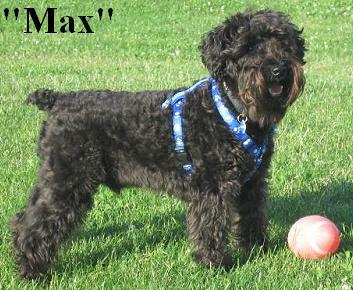 Max is styled in the schnauzer fashion. His hair is so soft and wavy. He is a great size about 15" in length from the tail to the neck and quite solid at 20 lbs. He is such a cutie and so well behaved. Loves to play with kids,adults,other dogs and anyone whos got a ball. He enjoys car rides too! 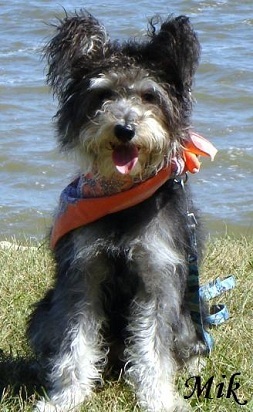 I just wanted to give you an update on Remy (our toy schnoodle). He is a wonderful addition to the family. He is 11.5 lbs and is just 7 months. He brings joy to some many people's lives. As you may remember, I am a teacher of children with special needs. He comes to school with me 1 or 2 days a week. The children love him. As you know, the benefits of therapy dogs are endless. We are also going to a care facility for elderly people once per week. He is so special. We attend training classes once per week. He is very smart and enjoys to learn all sorts of new tricks!!! He even rings a bell to cue that he needs to go outside to "do his business." I can't thank you enough for raising such a loving puppy. I know that it begins with the breeding. You are so gifted at what you do. Thank you again for all that you do! Haven't talked in a little while. We wanted to tell you that Khloe has been the most beautiful addition to our family and we love her with all our hearts. She is so smart, energetic and has a wonderful temperament. Whether we go for a long walk, play in the park or even stay inside and cuddle on the couch for the day, she is up for anything and really is a pleasure to be around. Everyone that comes over loves her and she has been playing so well and adjusting to other dogs she meets. So all in all, we love her and want you to know how happy we are with her. I'm dreaming of maybe some day adding another to our family because we love Khloe so much. Have a beautiful day and looking forward to hearing back from you.